I saw a movie, and then I read a book. If you are a follower of mine, this should now be sending off loud and dangerous warning bells. I do not like movies based on novels. They too often want to press artistic license via dramatic visuals or gender bending on to a beautifully written work. They think the visualization can expand the imagination. I despise these actions. Quit spackling literature with artistic license. 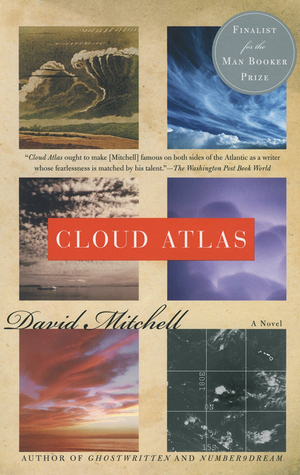 Now for Cloud Atlas. I saw the movie based on the premise depicted in the trailer. One story that spans six generations and proves that events span time and space. Rather unusual and sci-fi, I'm interested. The movie made zero sense. We bounce from one generation to another with little discourse and comprehension as to how A got to B. There are these people with comet birthmarks. Are they a gang, a secret society, relatives? What? We start in the early 1800s with a journal of a lawyer that is being read by a man in the 1930s who is corresponding with a man who wrote an academic treatise in the 1970s that is being hunted by a journalist whose life story became a novel to be published by a man whose life story became a movie that a clone watched in the undated future who became a god to a civilization in yet a further undated future. Weird. And a touch off putting to read as every section is dutifully written in the context of a journal/letter/memoir/interview of each given timeline. This means really outdated English and colloquialisms in the journal to just absolute guesswork on what the English language will look like in the apocalyptic future. Now, I am impressed that the author was able to write so cohesively in tone and style to each medium in the novel. As individual pieces, they are fantastic and the near future clone world would make an awesome sci-fi series. Put all six scores together as a whole composition and they are a work from Frankenstein. I think the author was hoping the whole novel would come together and reflect his idea for the six instrument symphony created by Robert Frobisher, our 1930s guide, via reincarnation. Unfortunately, it failed for me. Cloud Atlas failed on the whole premise of reincarnation for me. None of the characters that are supposed to be derived from their predecessor has anything similar in demeanor or conscience. There is not a single character trait that made me say, "Ah, this is the same person from the previous story." The lack of this transcendent essence made the entire novel feel like six unique stories stapled together and published straight to market, skip the editor. The movie certainly makes more sense now that read the novel and delivers that visual flair all movies promise will make it better than the novel. There wasn't a solid foundation for the movie to build shop on, so I'm impressed with the outcome. Neither is good without the other. Is that a victory in there somewhere for the movie industry?